In other news, water is wet and Milwaukee gets cold in the winter. So what's the reason I felt this is important? Looking at the numbers recap from the game helps provide some insight. This was Marquette's worst offensive efficiency of the season and a tie for the worst offensive eFG% of the season. Not surprisingly, MU lost on eFG%, but it was a surprise that Marquette lost on turnover rate. Although both teams were poor on offensive rebounding, MU won there and the team had a significant advantage on free throw rate (FTA / FGA). More on the significant FTR advantage in a few moments. If we look at these numbers, clearly we can attribute the loss to USF to our poor shooting and inability to capitalize on turnovers. After all, message boards were particularly harsh on Dominic James and his 1-9 performance from behind the arc. However, poor shooting doesn't actually tell the entire story. Going back to the statistical recommendations from our preview allows us to see which areas had the largest impact. 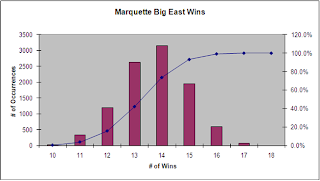 Result – Marquette eFG%% was 42.6%. Advantage South Florida. Changed margin of victory prediction from plus eight to plus four. Result – MU TO% was 14.1%. Advantage Marquette. No change to margin of victory prediction. It wasn't the poor shooting that had a larger impact on the game. It was the inability to significantly win the turnover battle. However, even after all that, Marquette still should have ended up winning the game. For this, we can only point the finger at the thirteen missed free throws. Free throws are important. How do things look with the remainder of the season? Right now the analysis gives a most likely view of 14 wins. Here are the rest of the percentages. There is still a good news story here. Thanks to the hot start, MU is still practically guaranteed a finish better than last year and they are predicted to end up with 14 wins. There's also still a one in four chance of getting to 15 wins, meaning that the team is in the drivers seat for the Bye-Bye. Tomorrow is another chance to win against a team that is very good at home. Finally, I'd also like to welcome John Pudner and BMA725 to the Cracked Sidewalks team. Now that I'm no longer the rookie, it means that it's their turn to carry around the pink Hello Kitty backpack. I'd like to believe that MU can win 14 conference games, but I just don't see it given the team's lack of size and depth and the difficulty of the remaining games. Even if they beat St. John's and Seton Hall, they would still need 3 more wins to reach 14, and they are going to be underdogs in at least 4, and maybe all 6, of the remaining games. UConn, Pitt, and Louisville are almost certain losses, Villanova is going to be tough, and Syracuse is a horrible physical matchup for MU if their injured players come back strong. Even Georgetown on the road will be tough. I think MU is much more likely to finish 12-6, or maybe 13-5, and that 11-7 is more likely than 14-4. Time will tell. I know the rankings don't really matter, but does anyone else think that MU got a bum deal by being bumped 4 spots in the ESPN/USA Today poll. Granted our loss was to USF, but Duke, Wake, Louisville, Clemson,and Illinois all lost and were only bumped a spot or two. In fact Illinois lost to the Badgers and gained a spot this week. What gives? One of my biggest concerns is finishing in the top 4 in the BE. Is there any analysis that shows the likelihood of that happening? Tony, that's one of those things that is perpetually on my "to-do" list. I tried setting it up once, but then my excel file crashed and I hadn't saved the work. In some early analysis, I thought MU's chances were pretty good, but maybe I'll get around to it. The problem is that the top team in the BE this year will likely have only 1-2 losses. This is in contrast to last year, where 13 wins got you third and 15 wins won the title. I know that there are a few threads on MUScoop talking about the likelihood of the double-bye. Now that I think about it, Dodds probably has a sticky on his site too. Sorry I don't have anything better. Maybe in a few days.